A year ago today I was watching the evening news when my phone rang. 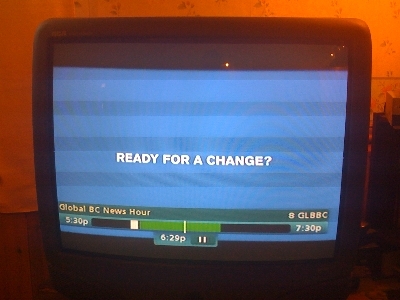 I paused my PVR, took the call, and then turned back to the TV where I was greeted by this question on the frozen screen, "Are you ready for a change?" Instantly, I felt in the grip of an appointment I had not made with God, but that God had made with me - perhaps even for me. I paused for a little while and stared at the screen and wondered what responding in the affirmative would mean. I answered, "Yes." and took a picture of this milestone message on an old tube TV. As is usually the case, saying yes to change turned my life upside down and then left me sideways. In September, October, and November God allowed me to experience epic moments of change that all combined to begin a new epoch in my life. I cannot yet see the long term result of what change has stirred up within me. Sometimes I am fine with that. Other times I long for the morphing cloud of what is new to finally settle so I can map out the renewed me and better know the path I am already on. My comfort in both times (and your comfort in such times) is to know the One who is doing the stirring.